Most of all of us don’t give it all we’ve got. Most of any of us don’t give all of the effort and all of the energy we can or should. Most of the time we don’t win, because we don’t play to win, and playing to win requires giving 100%, a.k.a., giving it all we’ve got. Most often, we only give “what we can,” and we only give “when we can.” We don’t give like we know we can or like we know should. We rarely give like we’re supposed to. Giving is Biblical and Scriptural. It’s sacred, but it’s not sanctimonious. Giving is spiritual. God gave us His Son, and Jesus, God’s Son gave us His life. That’s the secret. That’s the lesson. Giving your ALL and giving IT your all and giving it all you’ve got is the only way to win in life. And giving in sports is and should be no less. Giving it all we’ve got commands commitment – commitment to a common cause and commitment to particular person. Our commitment should and must to be to something AND someone. Both are required for a good and genuine, honest and heartfelt bond. One of the faults and failures of our modern, secular society is that we lack commitment. Employees change jobs and Christians change churches for something to do. The days and the age and the era of the 30 year employee and the 30 year church member are vanishing before our very eyes. Kids today wonder how their elder statesmen “made it” for 25 and 30 and 35 years or more at one job or one church. The answer? They didn’t quit when the going got tough but instead stuck it out and gave it all they had. Hannah Cockroft continues to give her all. She’s a paraplegic who defied the odds. She holds the Paralympic and world records for both the 100 metres T34 and 200 metres T34. 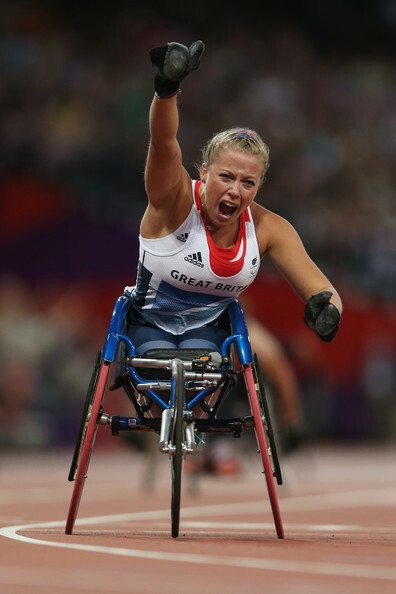 Competing for Great Britain at the 2012 Summer Paralympics, she won two gold medals. She doesn’t have two legs like of us, but she’s absolutely giving it all she’s got. I blogged about Hannah in “Winner’s Find a Way, Loser’s Find An Excuse” last year this time. Check out the December 12, 2013 blog post. http://www.godandsports.net/2013/12/12/winners-find-a-way-losers-find-an-excuse Hannah is a para-Olympic wheelchair racer. On her website she says, “Follow me on my road to Rio and beyond over the next few pages. You can laugh with me, cry with me and win with me, as I strive to become the best that I can be. And remember, you have to keep working to keep winning.” http://www.hannahcockroft.co.uk/ Amen to that. And so this Christmas Season, let’s give it all we’ve got. We’ve harbored hurts and nursed grudges and fostered fixations for far too long. Instead, let’s give more and forgive more and love more and hug more, and forget and forsake all of the things that are holding us back and pinning us down and preventing us from giving it all we’ve got.